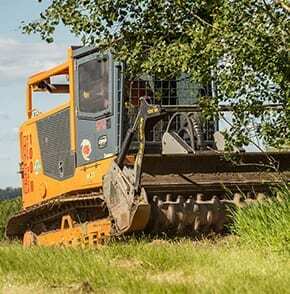 Landscaping and Mowing Services for Commercial, Utility, Residential & Government | Pevach Corp.
You've got land clearing needs covering a large area. We've got industrial grade rough-cut mowers & CMI machinery on what's pretty much a small tank. 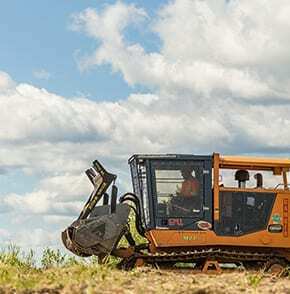 Whatever your land clearing needs, whether you’re maintaining highways and power lines, creating a new park or picnic area, preparing a constructing site, or keeping your acreage clean and tidy, we’ve got the equipment to get the job done fast. The land around oil & gas facilities, new construction sites, facility lawns, the ground beneath power lines—it all needs to be trimmed before it becomes a bigger, costlier problem. Set up a contract or a one-off job with us and it’ll get done—on time and on budget. If your organization owns or operates anything bigger than an office in a strip-mall then you’ve probably got land that needs to be kept looking good and free of hazards. Same goes for your town or city: you’ve got trails, roadsides and public spaces—all of it needs to be taken care of. You could be enjoying your acreage or spending time and money trying to chop away at saplings with a rusty axe. Your call, but if your idea of a Sunday afternoon is sipping a beer on your porch rather than getting sunburnt toiling away with trees, then give us a call.